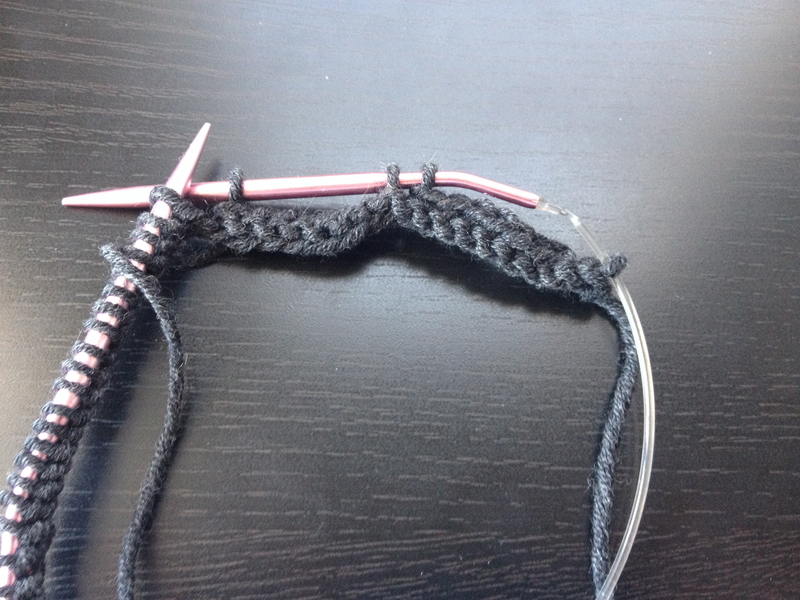 I’m making lots of knitting progress…The Friday FO trend continues! 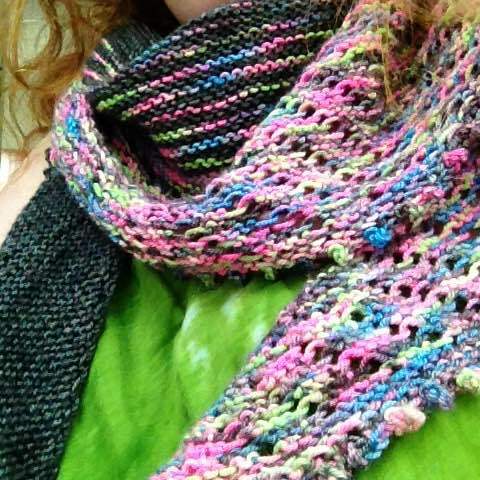 The yarn was the motivator here, hand spun and hand dyed by a friend! Upon further inspection, I seem to have stuck to the original plan?!? 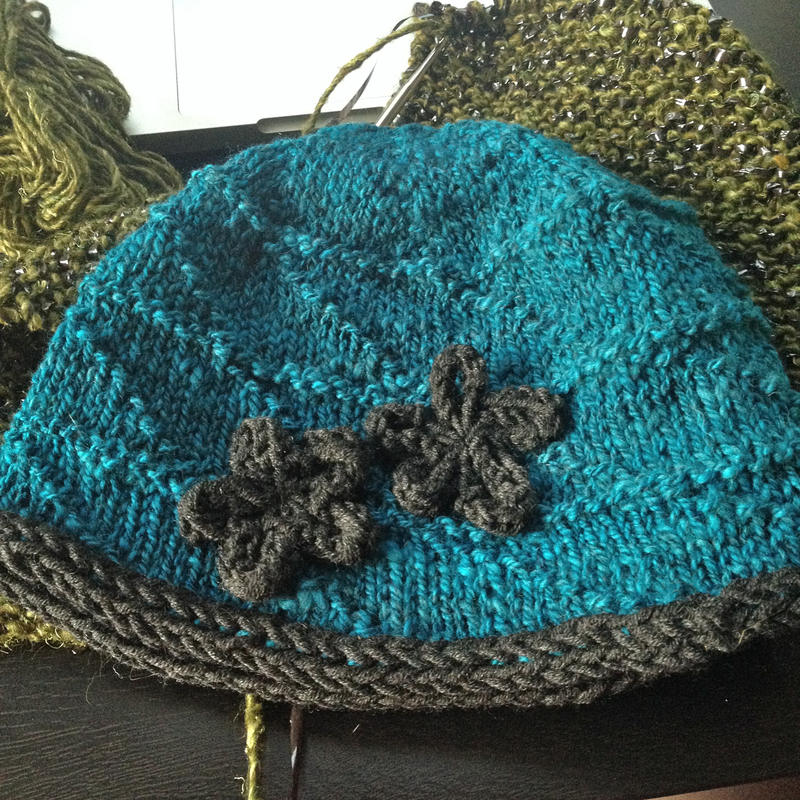 A top down hat with a dark i-cord bind off! 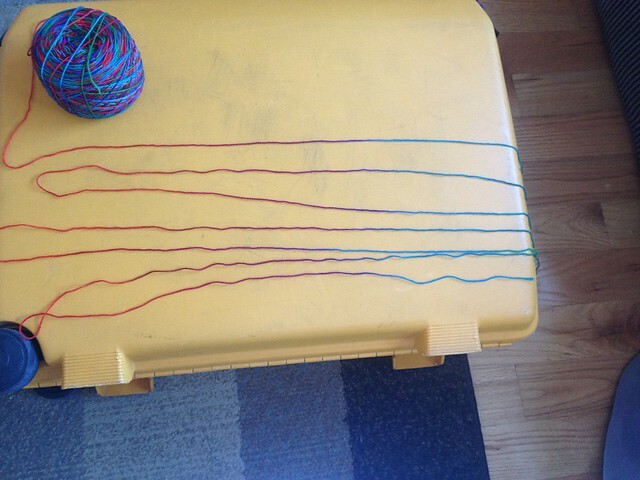 I went top down to use up every inch of the yarn and to avoid doing a real swatch with math. 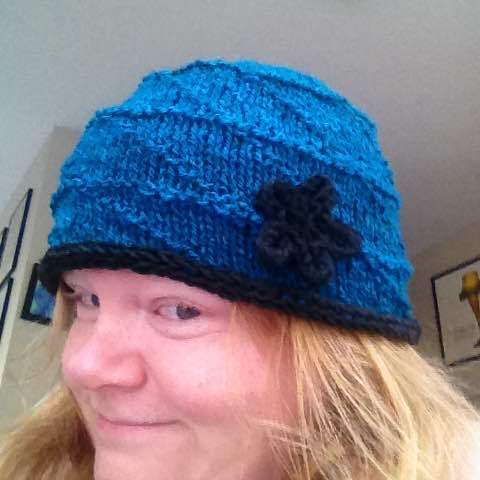 I just worked increases on alternating rows until the top of the hat looked big enough. I added a few purl ridges and spirals to the body for visual interest. And then, I went all the way with the i-cord…provisional cast on for first 3 stitches, then grafting them to the last 3 stitches for a seamless finish! I usually take the lazy way out but this practically fell off the needles on its own, it was worth a tiny bit of effort for the one little detail! And then I turned into my Mother. It happens to everyone on occasion. I’ve learned to just go with it until the feeling passes. In this case, it wasn’t going to pass until I made a flower for my hat. I’ve made a lot of different flowers over the years (most of them for Mom, she likes flowers. a lot.) This one is just about the easiest! 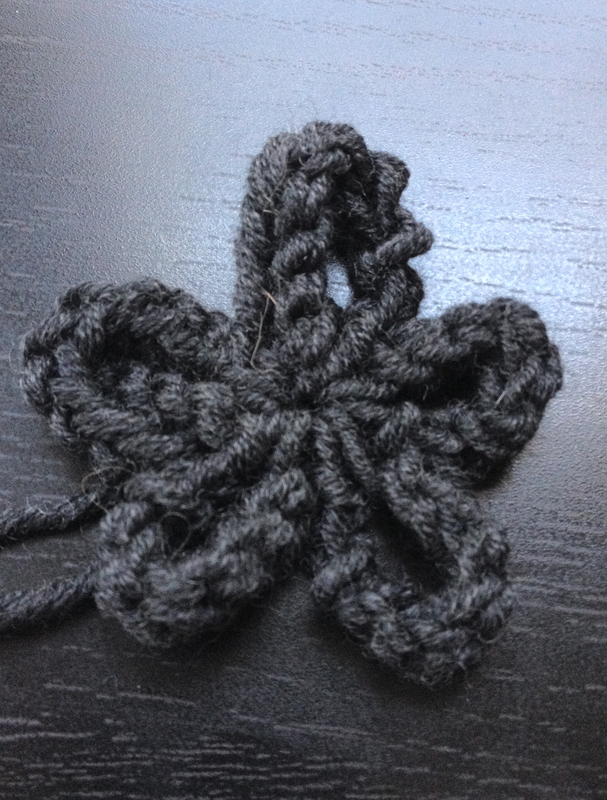 You cast on, work one row that’s mostly binding off and then cinch your remaining stitches into a cute little flower! Done! You can customize this flower in several different ways cast on more stitches to make it larger, cast off longer segments to make the petals longer or even cast off in shorter segments to increase the number of petals! Cast on 45 stitches. I used the long tail, it’s a good one because it has enough structure. 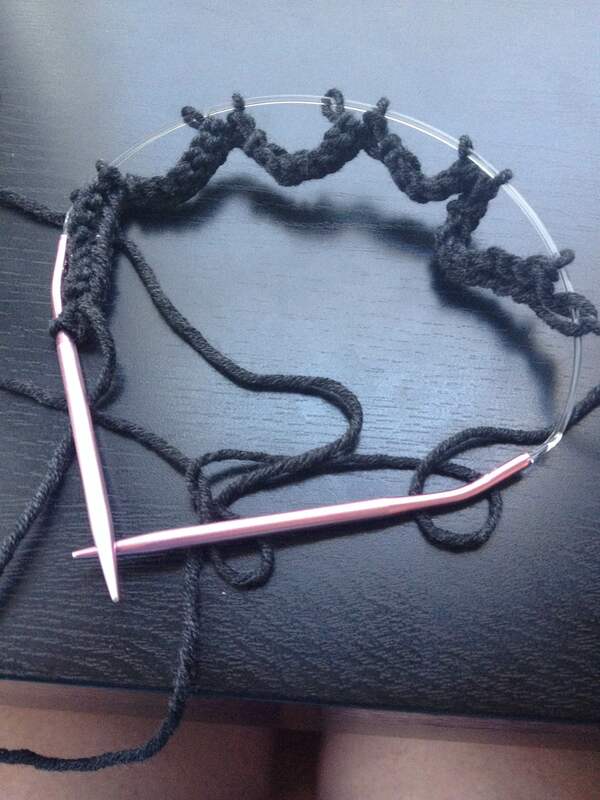 Knitting On would be a bit floppy and weird. Knit the first stitch, then bind off the next 7 stitches, this leaves one stitch on each side of the bound off segment. 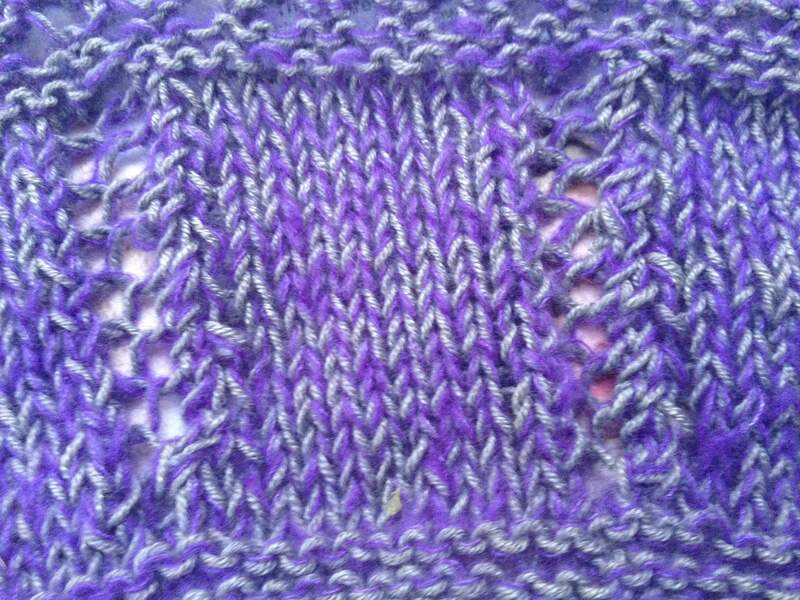 Knit another stitch, then bind off the next 7 stitches. You now have 4 stitches on the needle. Continue down the row in this fashion, at the end, cut yourself a tail, pull it through the remaining live stitches, give it a cinch and you’ve got yourself a groovy little flower! Of course, if one tiny little flower is cute, then two is even better! I have a feeling Mom approves! It happens. Sometimes I can’t fight the urge to cast on as many projects as possible. 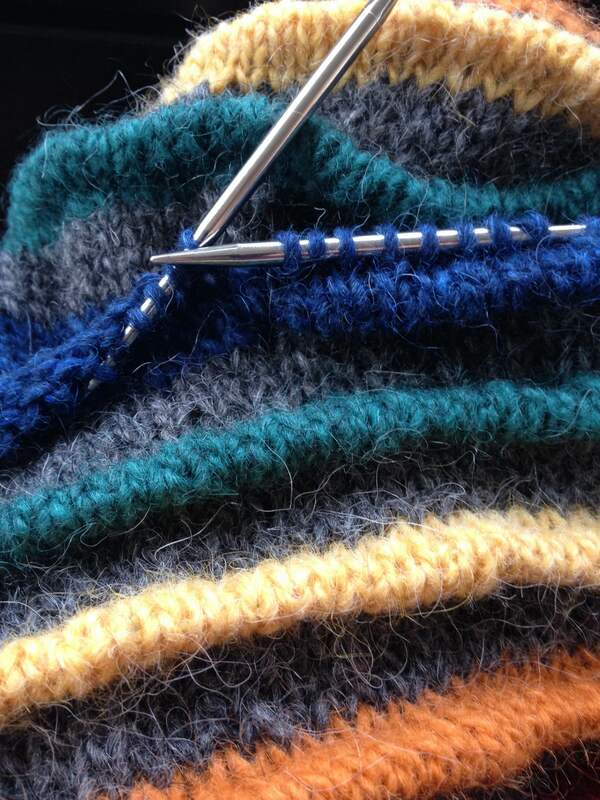 I gave myself 24 hours after Stitches to start as many projects as I wanted. I thought I was going to start 4 new things, instead I started two new projects BUT I started them both twice…so mission accomplished, I guess!? The first project is a selfish one. 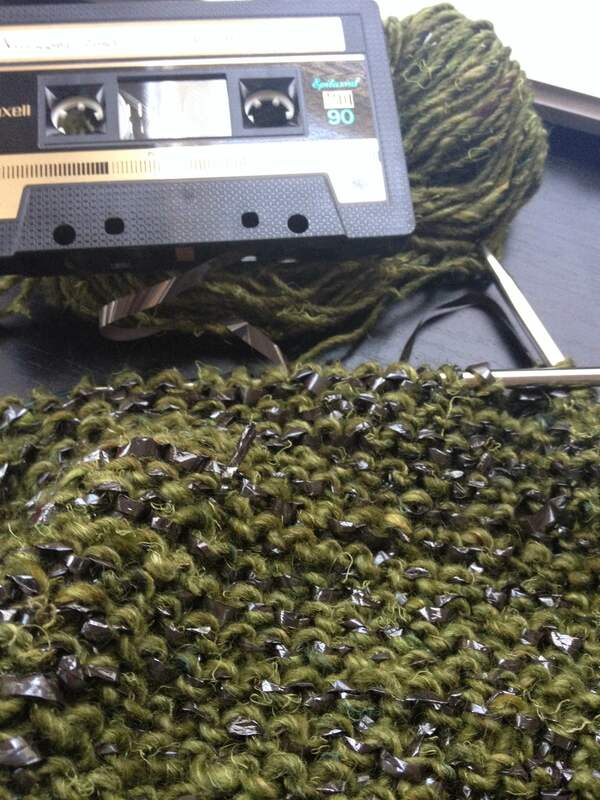 I’m making myself a cassette tape vest. I’ve made a few cassette tape hats and now I’m hooked! I want all my clothes to have cassette tape in them! This time I’m going with one strand of Noro Silk Garden Solo and one strand of Maxell XLII 90! It’s so fun! 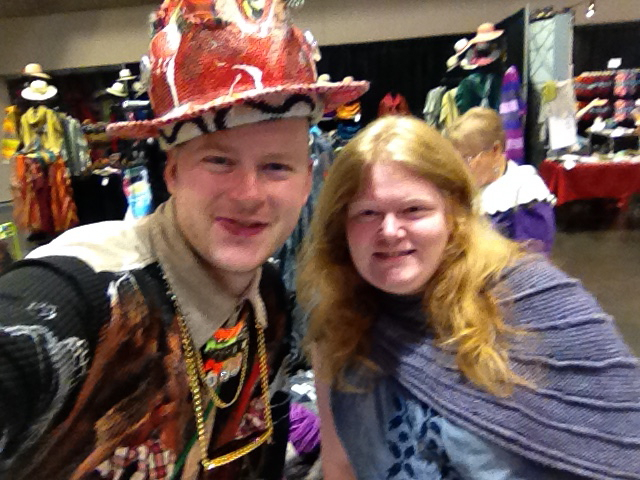 Plus, if I’m ever an extra in a post-apocalypse movie, I can bring my own costume! This one got started twice because of a gauge problem. Turns out Silk Garden and Silk Garden Solo are not the same, despite being labeled the same! The Solo is more consistently spun, no thick & thin to it, that bulked up my gauge significantly! I swatched with Silk Garden, 4.5 sts/inch but the reality of Solo was 3.5 sts/inch. A bit of math, a quick frog and I was back in business! This is gonna be so awesome! I can’t wait! The second project may very well end up a selfish one. In theory, it’s for a friend but I may not be able to part with it! I’m not gonna tell you what it is but I will tell you it’s Panda Silk (drapey bamboo with a silky sheen) and Superior Cashmere (lace weight Cashmere!)…Yum! It’s an awesome combo! This project will hence forth be called the Purple Haze. This is also going to be awesome! This one was started twice for gauge reasons again. Seriously, when ‘they’ tell you to do a gauge swatch, it’s actually for your own good. One day I’ll heed their advice. I did a few rows and realized I didn’t have quite the amount of drape I wanted, so I frogged and restarted a size larger. 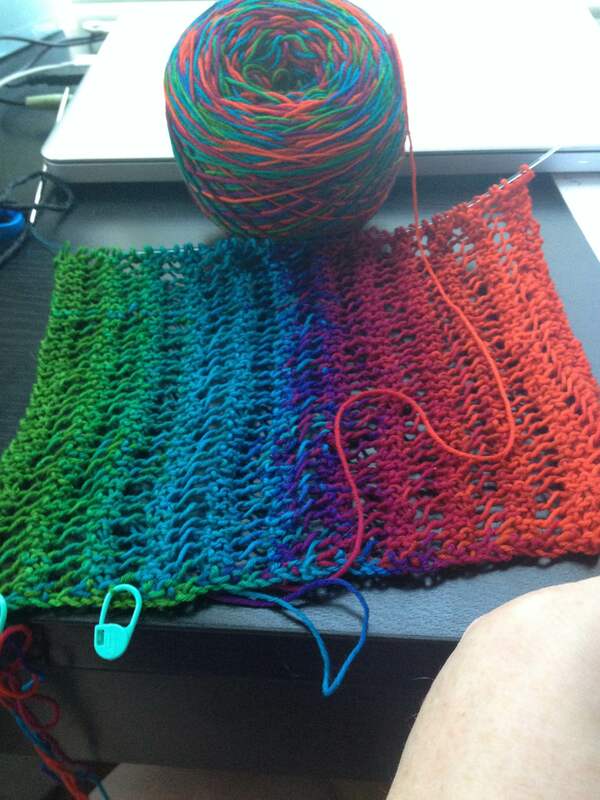 It’s almost like I did a gauge swatch. I just like calling my gauge swatches ‘casting on’. Planned pooling is something I’ve wanted to tackle for a long time! I’m finally getting the chance thanks to my friend Bambi and a bet I won. Bambi paid up in glorious fashion, with a skein of Wollmeise in colorway, Sultan! Thanks Bambi! 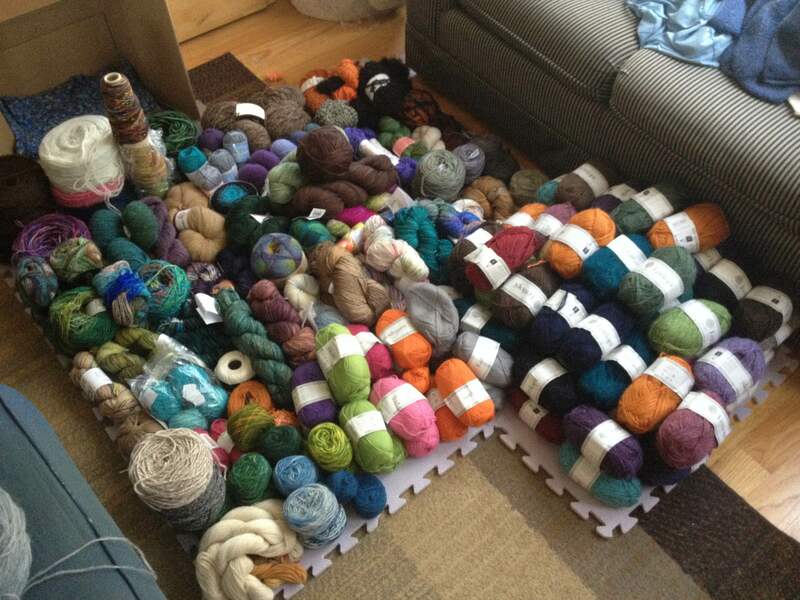 Yarn collectors go nuts for this stuff and I can see why! The colors are lively and vivid, photos don’t do it justice! But lets be honest, if the variegation is left to it’s own devices, the end result is a truly horrible mess. 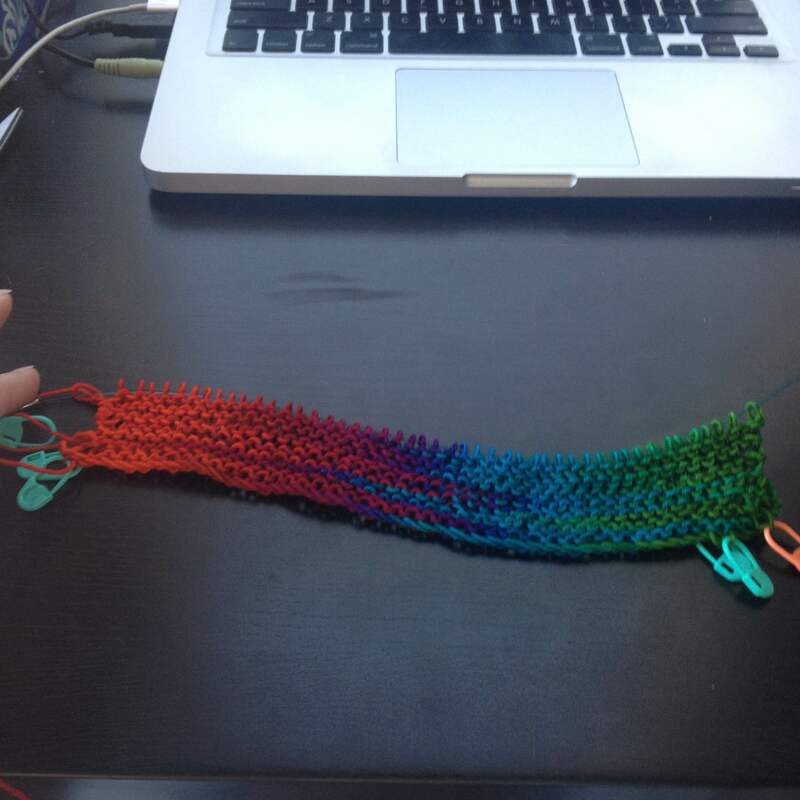 Planned pooling, on the other hand, showcases this yarn in all it’s glory! And this yarn is dyed in the just the right way that the color sequence can be laid back on itself with each new row, stacking the color into columns! After deciding that this yarn would indeed work for stacked pooling, I fiddled around with swatches and decided my magic number is 48. 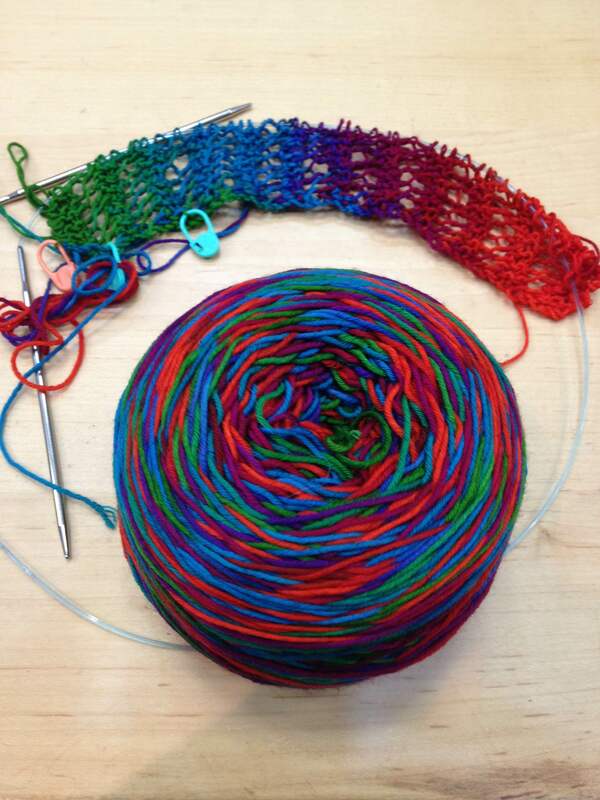 The magic number is the number of stitches required to use exactly one repeat of color per row. The rest is conceptually simple and with a little practice, it’s easy to execute! Cast on your magic number and knit away, using one full color repeat on each row, the colors should line up, red on red, blue on blue, all the way down and back again too! 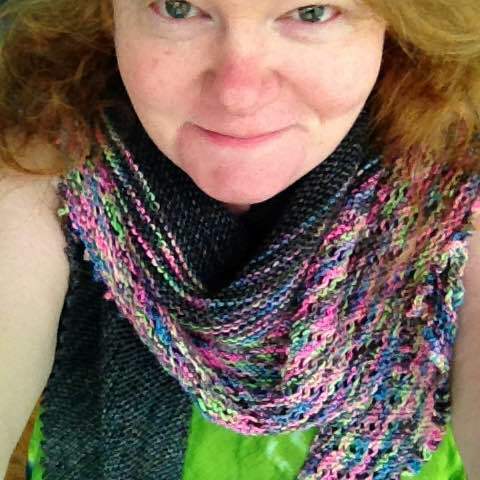 I practiced a bunch in plain old garter stitch, just to get a feel for it. It came easy with a bit of practice, just modulate the tension a bit if things aren’t stacking exact. It becomes second nature as you watch the colors slip through your fingers and match up! Ultimately I decided on the One Row Lace Scarf. I think the lace provides a bit of wiggle room with the way the colors stack. Once I got started, it’s been smooth sailing! I can tell already, this is going to be a great travel project! It’s certainly not going to languish at the bottom of the queue anymore! 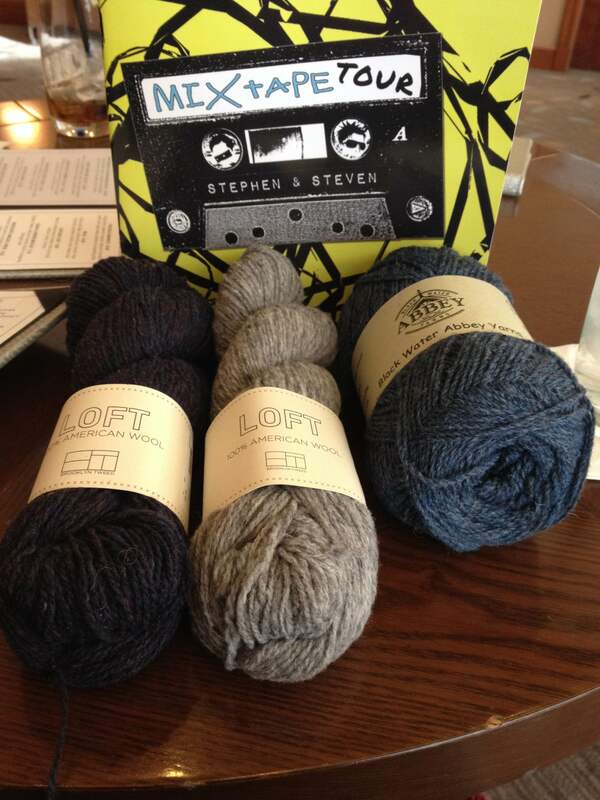 I stuck to my budget at Stitches…the cash in my pocket only! Didn’t even go to the atm to fill the pocket first! I got lucky and won a door prize, so that made the budget seem a bit larger (a lovely skein of sport wt irish wool from Black Water Abbey!) My theme for the weekend was clearly Rustic Wool! 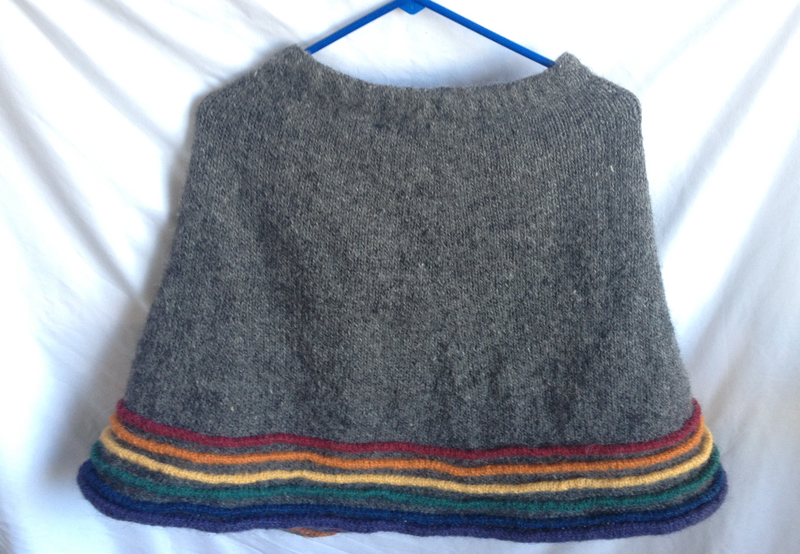 Having just finished a Lopi skirt, I was on the hunt for Brooklyn Tweed! 100% American made wool! The return of the American textile industry is pretty exciting and I have yet to sample Brooklyn Tweed’s offerings. After my visit with Stephen West (where I picked up the mix tape tour book! ), it was off to A Verb For Keeping Warm. Seems a little silly to travel 40 miles for a Verb booth, when the real thing is only 15 miles away but I did it anyhow. Fiber addiction is not logical. 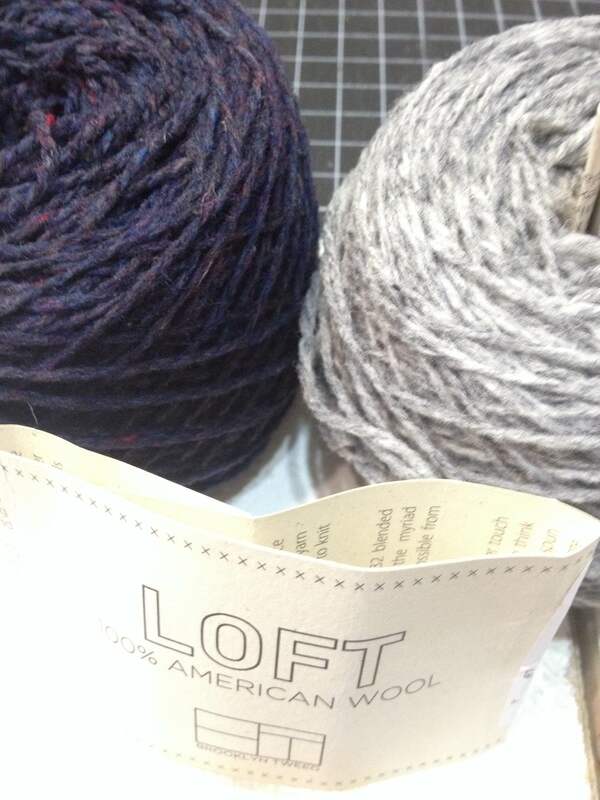 My budget allowed for two skeins of Loft, in Old World (L) and Sweatshirt (R). I can’t wait to use this yarn! It’s lofty all right! It’s got all those words we love…squish, bounce, spring. And, it’s pretty affordable all things considered. Made in the USA and under $15 a skein AND it’s amazing! I’m accessory minded for these two skeins but I can tell already I want sweater quantities! One slight problem there, I usually flash the stash pre-Stitches to remind myself of the unknit sweaters I’ve already got. Time got away from me and I didn’t flash the stash until this morning. I’m pretty sure, I won’t need the sweater quantity of Loft for a couple years. The stash, as of today, no WIPs, no partial balls, no Loft. Lopi in the front, loads of MadTosh behind that, two sweaters worth of Miss Babs’ Yowza behind that. 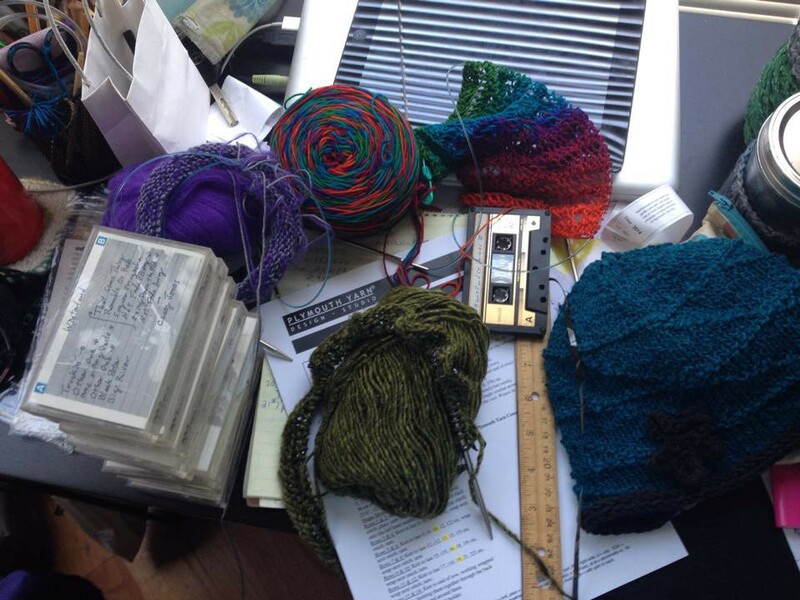 Noro has developed into an entire section of the stash instead of just a random skein. Cephalopod, Vice, Kauni, Frog Tree Alpaca, Misti Alpaca, Unspun Lopi, Taria Tweed, Sweet Georgia. Don’t bother me, I’ll be knitting! 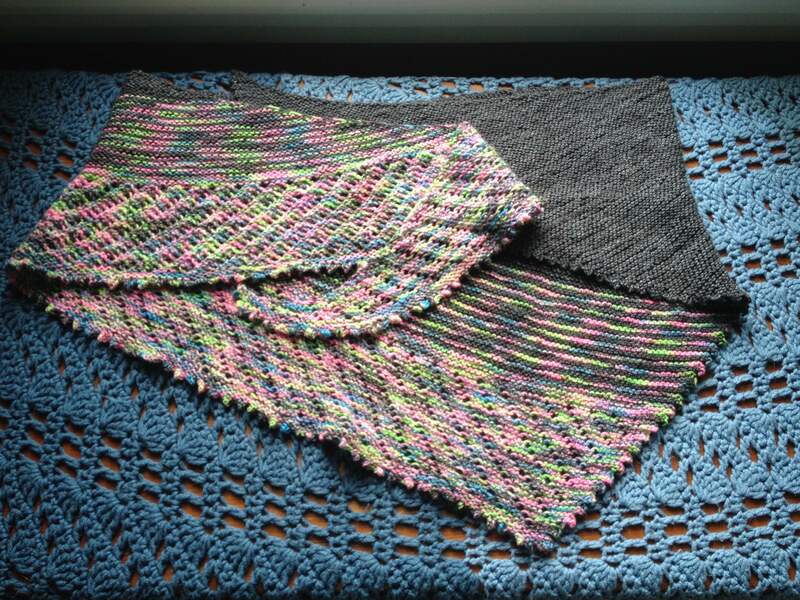 Another Friday, Another FO to share! 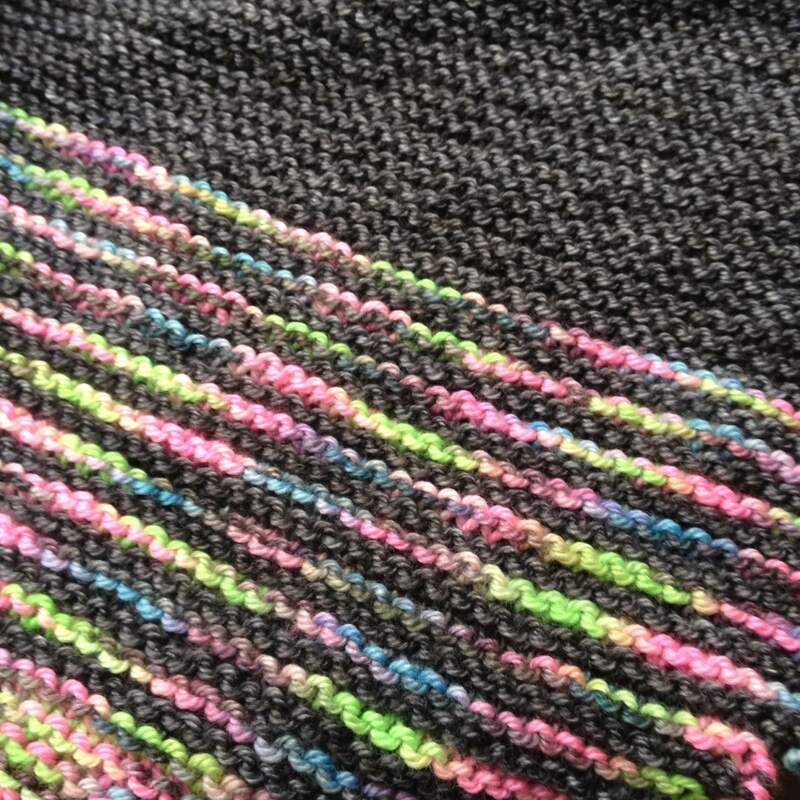 I was very excited to bring this fun neon variegated yarn home. It sat in the pile for quite a while before I cast on though. I was afraid of pooling. 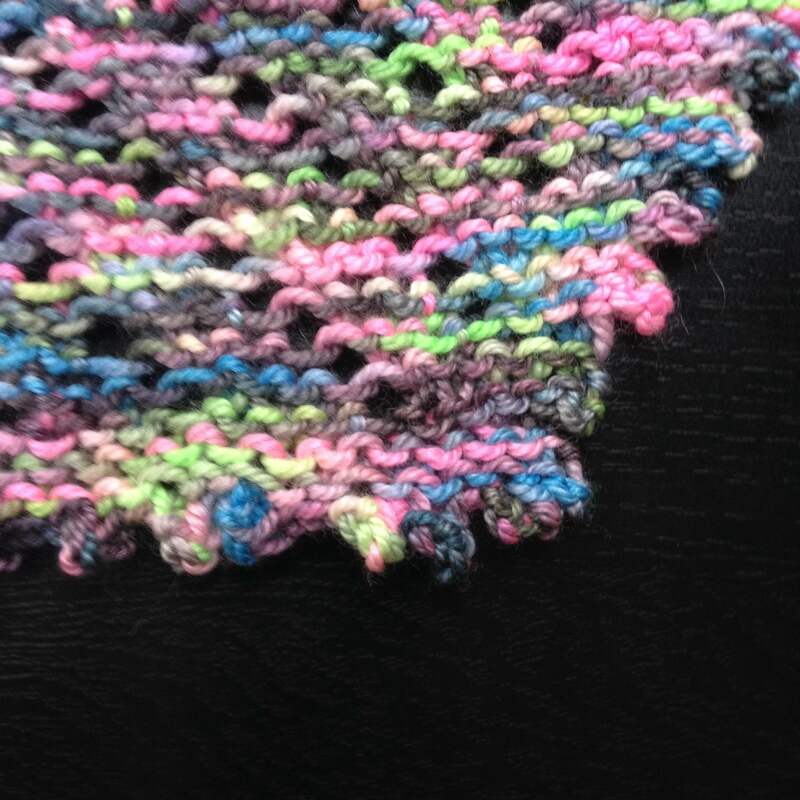 Good yarns frequently turn bad when Ugly Pooling decides to visit, especially when it’s a loud yarn to begin with! And this is a very loud yarn! Pairing the neon with something to tone it down a bit was a great idea…so the stately El Greco was invited to the party and the other guests loved him! Perfect Match! 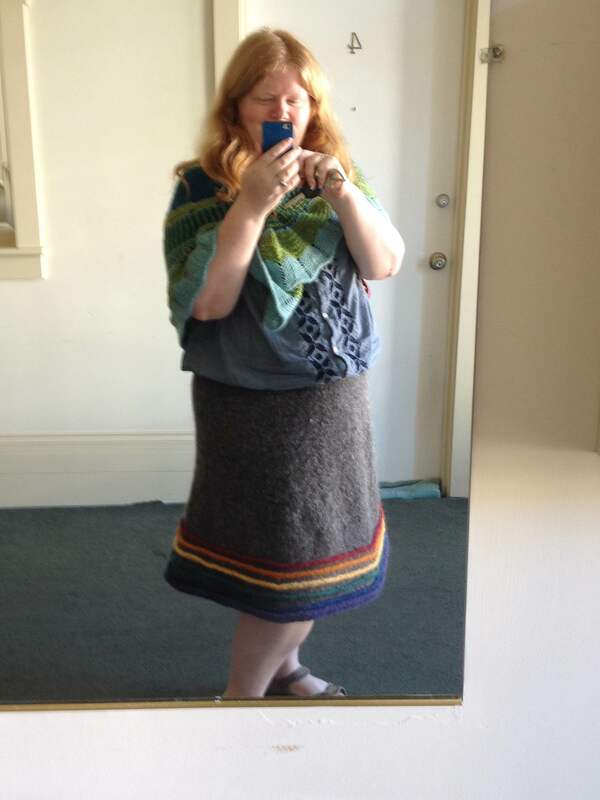 Next decision: I knew I wanted a shawl but which one? I decided on Cameo after seeing a friend’s in solid colors! It was stunning but the lace was pretty basic! Just my kind of lace–minimal work with big impact! The lack of a themed motif worked perfectly! No leaves or pineapples to get messed up by the variegation…just a simple K2tog/YO sequence for visual interest! I fell into a nice groove working it, to the point that it became my go-to travel project. I had a few mods: I attempted to follow the directions regarding stitch count and number of stripes, I couldn’t get there with the El Greco though. I started the stripes sooner than the pattern called for and still only ended up with 11 contrast stripes. No biggie, I just extended the lace when I got to the end. I did the two lace repeats called for and then did an additional 12 rows of lace to use up all my yarn! I’m very happy, it still looks appropriately balanced. I’m calling this one a win!